As a photographer I see it as my role to record events and not to set them up, but sometimes that does mean not quite getting the pictures that I would like. But I think it vital to place integrity above impact, though of course I work hard to make pictures that tell the story as best I can. 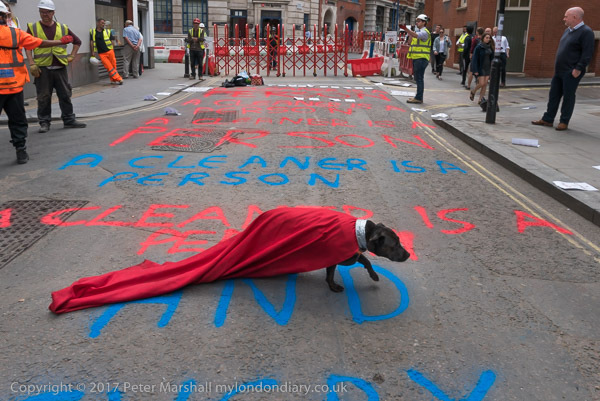 I’d earlier walked several times past a poster in one of the many street-facing windows of LSE buildings which celebrated the LSE’s record in fighting inequality, and thought it was one which spoke to the central theme in the dispute between the cleaners and the LSE, and thought it would be good to use it in a picture. So as students marched past holding the appropriate banner I tried, but rather failed as you can see above. The marchers were walking quite fast and there were a number of parked bicycles at my right that made it difficult to get into exactly the right position, and I was a foot or so too far back to keep ahead of the banner by the time I could take the picture. Had I been setting this up I would have had a second chance – and more, but the moment had gone as soon as I pressed the shutter. It would have been nice to have had the letter ‘I’ at the start of the word ‘Inequality’, to have got the gut carrying the rear pole of the green banner to move a little to the right, to have moved a little to my right and framed the poster and the banners a little more tightly… But that would not have been how it happened. 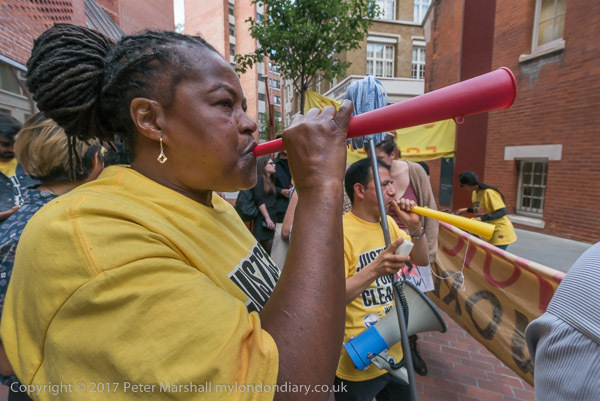 Of course there are some posed images in my set LSE Cleaners strike for equality on My London Diary. But they are pictures that those taking part set up and posed themselves in, not ones that I imposed on them. 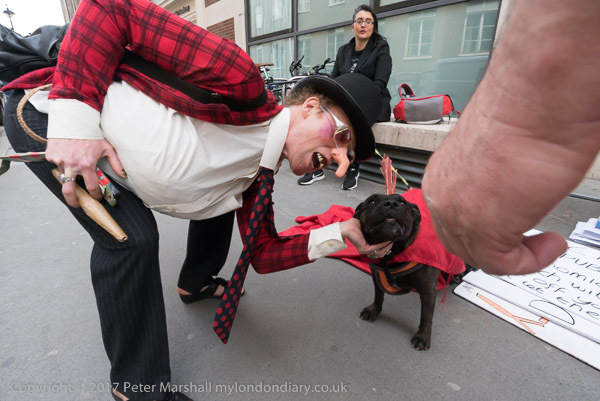 Sometimes other photographers do set up pictures and I sometimes also photograph these, though I try to make clear in the caption with phrases like “pose for photographs”. But generally I photograph things that happen as they happen, though of course I impose my own order on them. Though I do like a bit of chaos, which can help to get away from the clichés. 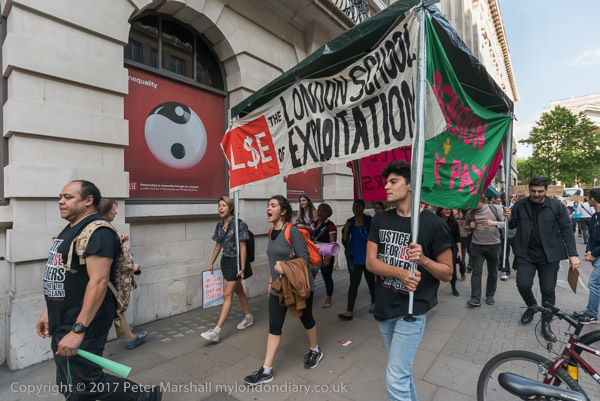 The group sprayed chalk slogans on the road chanting ‘London School of Exploitation’ in a wide range of silly voices and then performed a short play in which a character playing the LSE director tore the shirts off the backs of several cleaners and boasted about his huge and rapidly rising salary. The tall buildings surrounding Portugal St created a rather eerie echo as the players chant loudly ‘London School of Exploitation’ in a range of silly voices, and the interruption of proceedings by a cement mixer and a man on some kind of cherry-picker (what a useful photo accessory that would be) somehow added to the event. 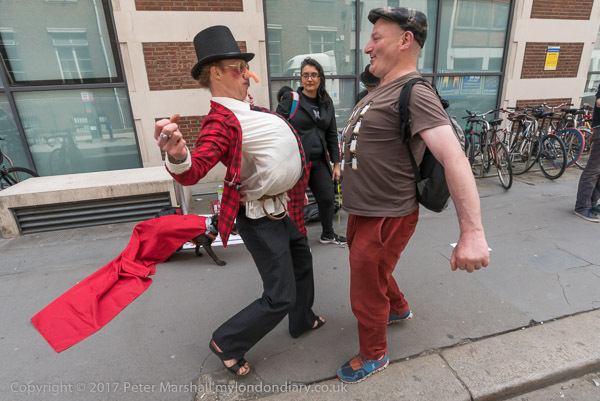 But I did feel it was one event where sound and movement would have helped, though I think it would have needed a team with several cameras to film it adequately. 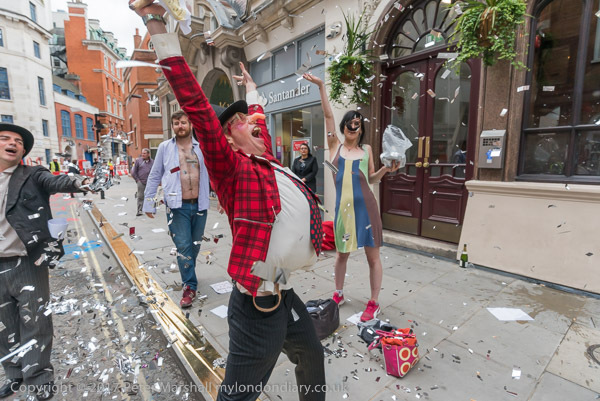 It wasn’t too easy to follow the finer details (such as they were) of the playlet that ended the performance, with several cleaners having the shirts stripped off their back by the ‘LSE Director’, a little rogering and a lot of tinsel, but I did my best. This entry was posted on Thursday, November 30th, 2017 at 09:25 am and is filed under My Own Work, Photo Issues, Political Issues. You can follow any responses to this entry through the RSS 2.0 feed. You can leave a response, or trackback from your own site.